A number talk is a 5-10 minute, daily, mental math routine. 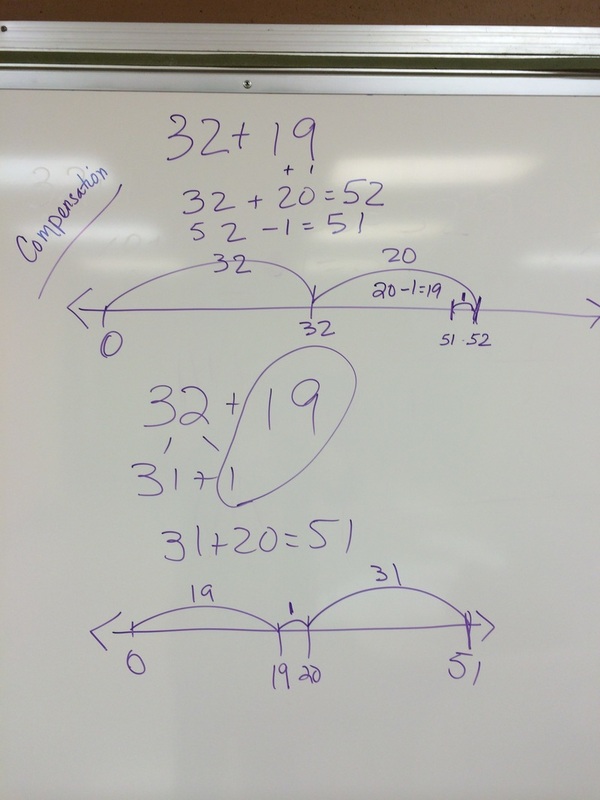 The goal of a number talk is to solve a problem in more than one way! The teacher facilitates the student discussions around strategic problems that build students' fluency and math understanding of concepts. This video shows teachers explaining what they love about number talks! This is Chapter 1 of the book Number Talks by Sherry Parrish. This give a more detailed description of what it is and explanation of fluency! Check out the computation and fluency page on this website for more information as it relates to the Common Core Standards! Teacher writes a problem on the board. It is important to write the computation problems horizontally! Students solve the problem mentally. They use hand signals to signify when they have an answer and how many strategies. A thumb up means "I have an answer and a strategy." Thumb up and another finger out means "I have two strategies." The teacher calls on several students to give the answer - no explanation. The teacher writes all the answers on the board. Try to call on several students. Students can use hand signals (thumb and pinky extended, waving back and forth) to agree with other students. The teacher calls on students to explain their strategies. Call on students who do not have the correct answer first. Most of the time, the students, during explanation, will solve the problem correctly. The teacher records exactly what the student explains. The teacher will elicit the use of talk moves to facilitate the discussion. 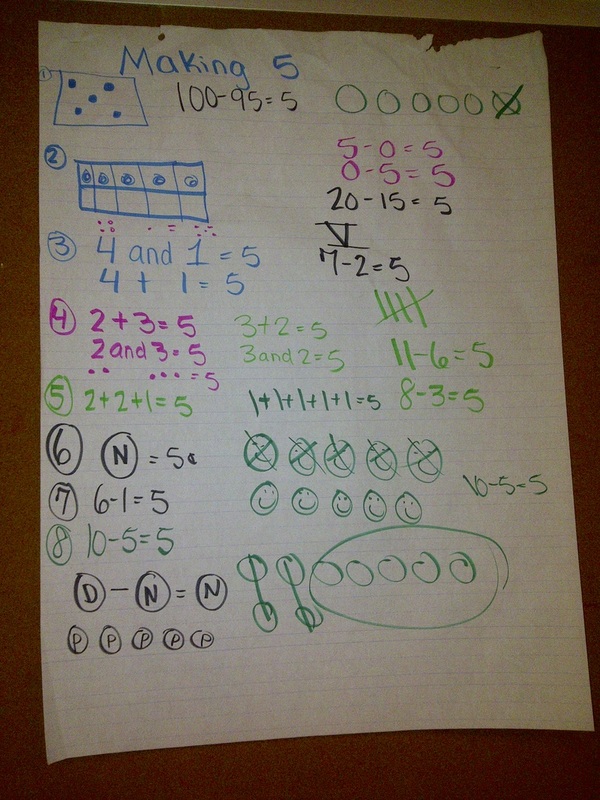 Once all the different strategies are done, the number talk is over. A teacher can ask a few closing questions that elicit comparing strategies. In classroom observations, the number talk has become one of the favorite routines for students. I cannot reinforce how important this daily routine is. I have observed many classrooms, and I can tell who does one daily and who does not! The talks moves can help make sure that all students listen and participate in the number talk. 1. Revoicing – The teacher restates (as closely as possible) what the student has said. “So you’re saying that . . .” This way all students can hear it, and the teacher is checking with the student to see if this is what he/she means. At this time a student may further explain or clarify. 2. Repeating – Ask student to restate someone else’s reasoning. “Can you repeat what he just said in your own words?” This is helpful to have students explain someone else’s strategy. A first grade number talk - Target Number 5. The teacher did this for the first time and was amazed at all the ways students could record 5. She did not know some of them knew Roman Numerals! It was great! A number talk with 2nd graders showed using compensation at the top and using friendly numbers by sharing on the bottom. We have been working with number lines to show the strategies.